IBM has kicked off preparations for this year’s Wimbledon 2018 with some nifty IBM Watson services. With this year’s tournament just weeks away, the company revealed it has called in Watson to help design the official poster for Wimbledon 2018. Watson’s visual image recognition API has combed over the All-England Lawn Tennis Club’s (AELTC) historic archive of photos to create a composite of 8,400 items. "It's a fantastic collaboration for us to use artificial intelligence to celebrate such a milestone," IBM’s Sam Seddon said at the launch event in London today. 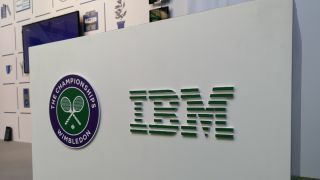 The launch coincides with the AELTC's 150th anniversary, and marks a further step foward in the relationship between the AELTC, Wimbledon and IBM. The two organisations have been working closely since 1990 to use technology in order to improve both the visitor and player experience at Wimbledon in a variety of ways. "Wimbledon is trying to change the perception of its brand - we are a private members club that runs a tennis tournament, but we are also trying to transition into a data-driven media organisation,” said Alex Willis, head of communications at the AELTC. "People are judging Wimbledon on the experience they had last week, or event yesterday. Technology plays a really important enabling role...increasingly we're recognising the role of AI...in being a foundation of that digital experience and strategy." Last year saw the launch of Fred, a smart assistant designed to help visitors navigate their way around the grounds, as well as a new AI-assisted method of curating and launching highlights. Wimbledon 2018, set to kick off on July 2nd, will see improvements on these services, as well as the launch of a new Facebook Messenger chatbot that means fans will never miss updates on their favourite players. "What's so fascinating is how the applications and the role Watson can play seems to expand every year,” Willis told TechRadar Pro. Looking to upgrade your tech in time for summer? Check out our guide to the World Cup season here!